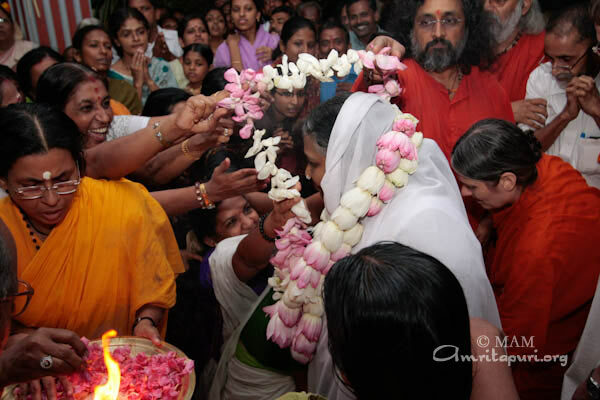 Amma’s third program of this month’s yatra was in Palakkad. 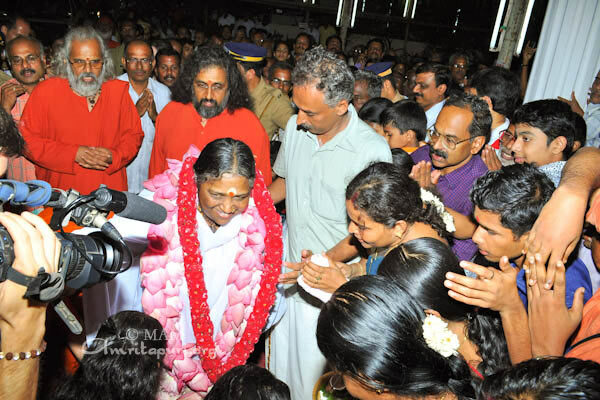 The devotees were thrilled to see Amma, this being the one day of the year that Amma gives darshan in their hometown. 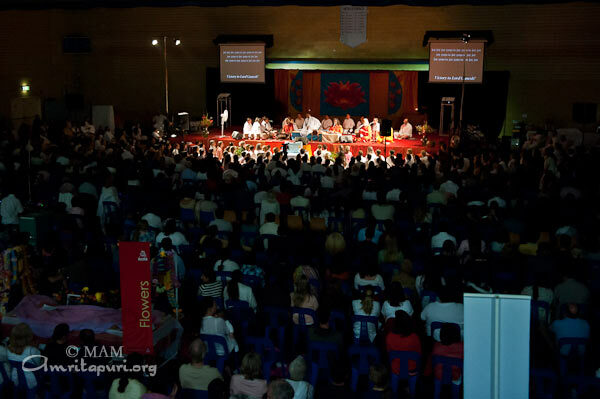 There was supposed to be two days of programs, but as there was an all-state strike, it was not possible to have a second day. 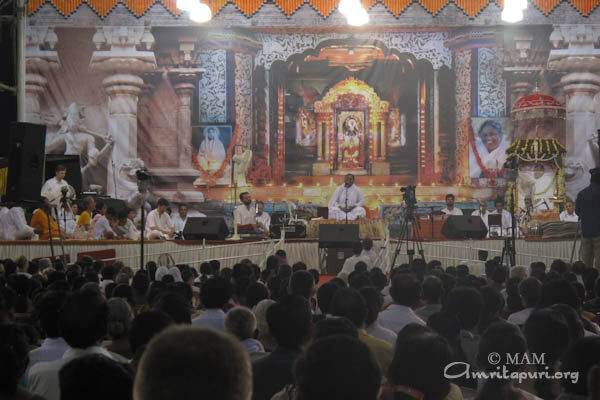 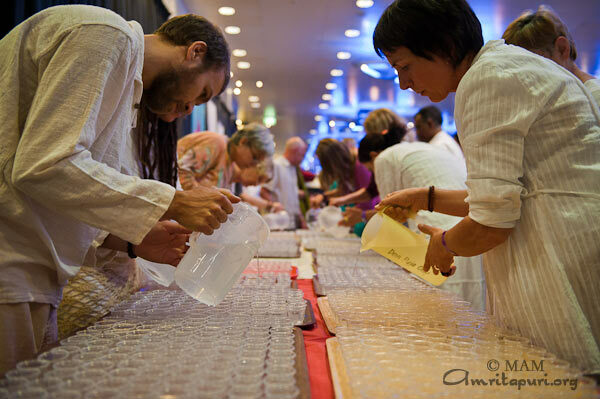 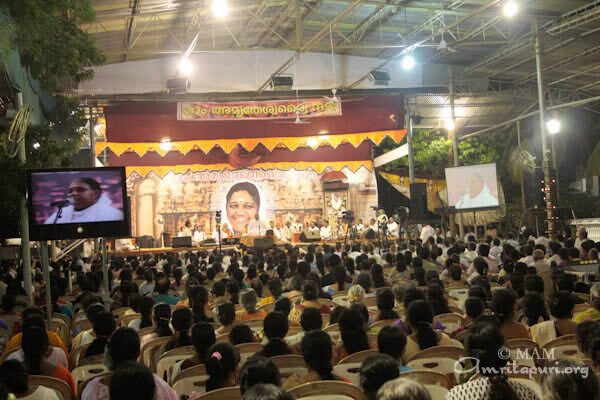 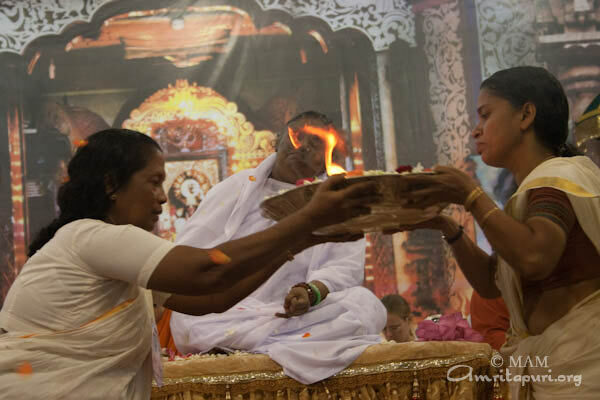 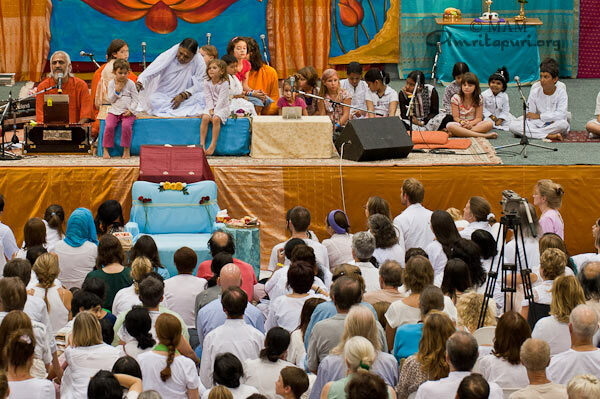 As the devotees came in increasing numbers, so was the temperature, the heat scorching everyone at above 40 degrees C. However, everyone was willing to withstand the extreme weather in order to get a moment close with Amma, to unburden their sorrows to her. 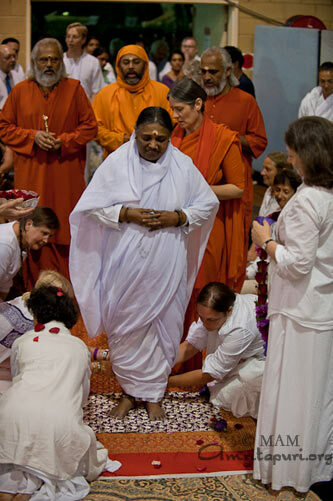 There is an old verse in Sanskrit, ‘giving shade to others, while standing themselves in the scorching sun, giving fruits to others, Mahatmas are like trees*.’ Amma personified this saying, offering herself to the thousands who came for relief from problems, or those who came out of spiritual curiosity. 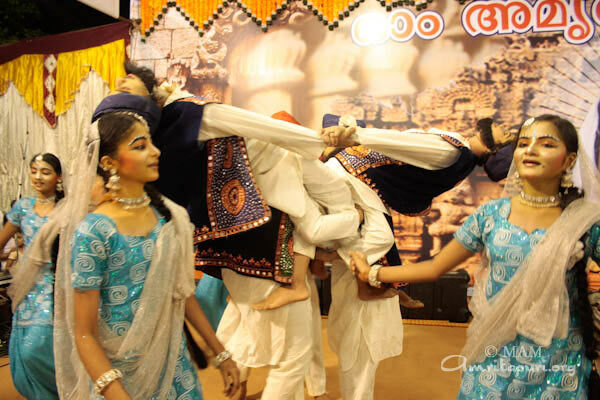 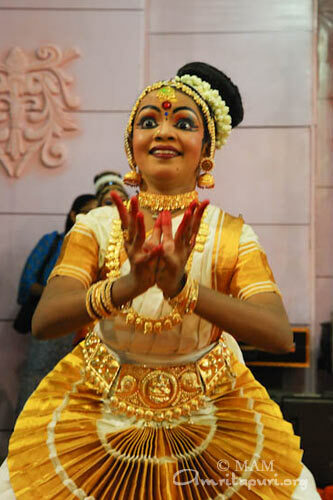 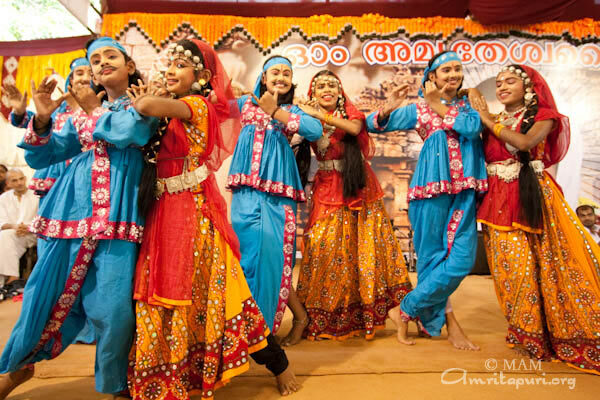 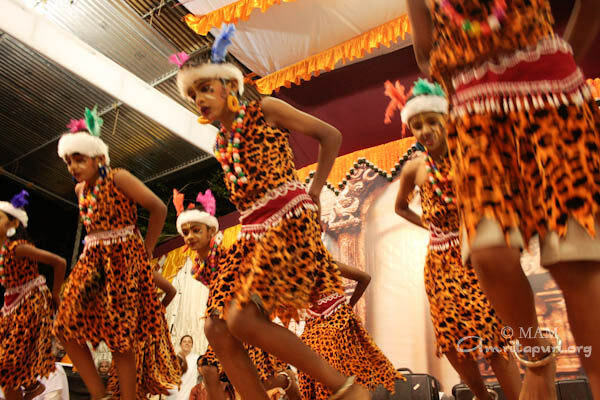 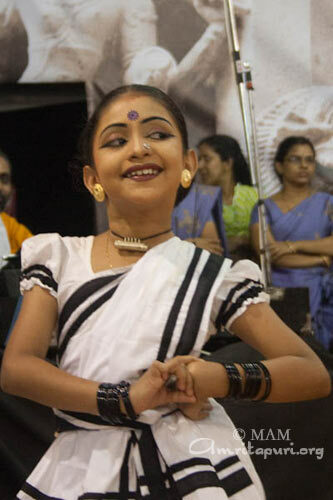 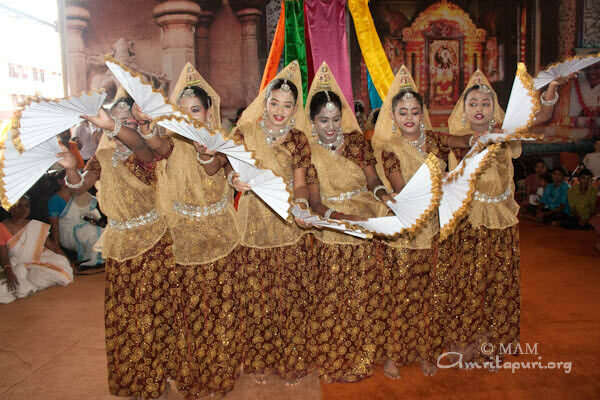 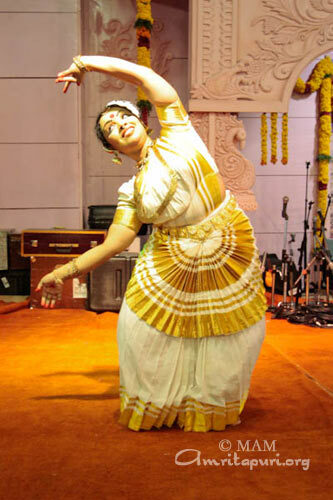 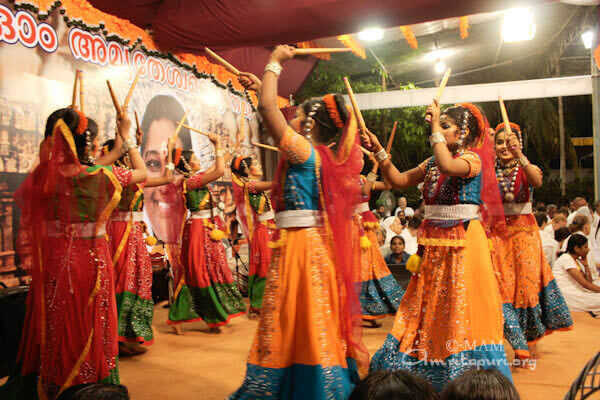 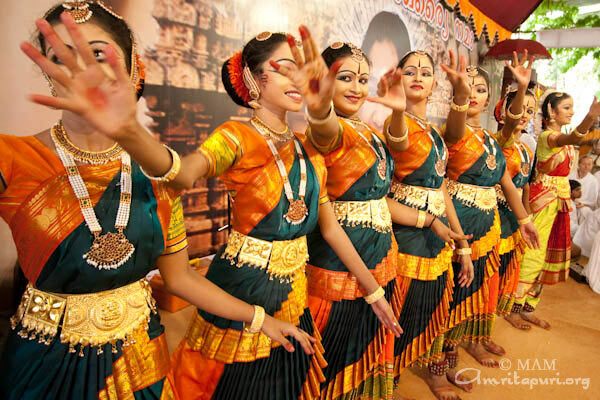 Students from the Palakkad Amrita Vidyalayam performed a variety of cultural dances during the darshan. 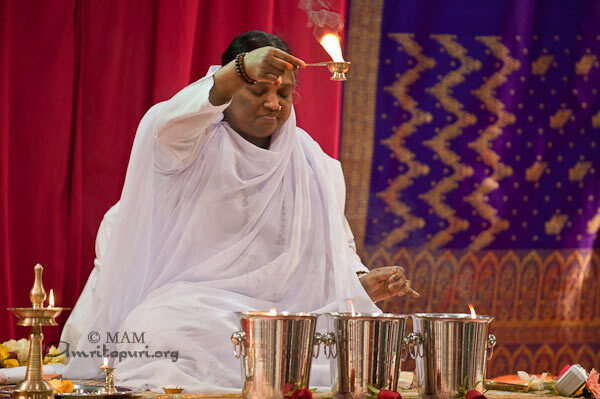 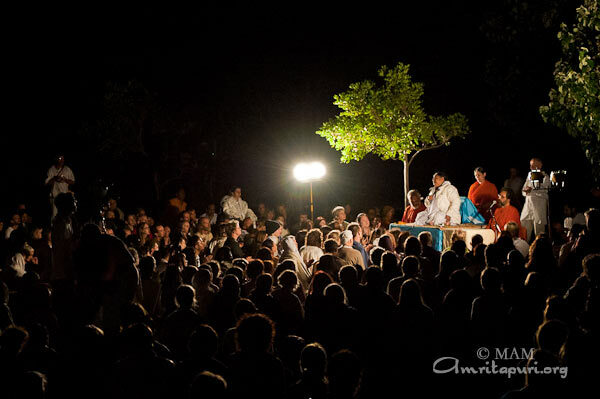 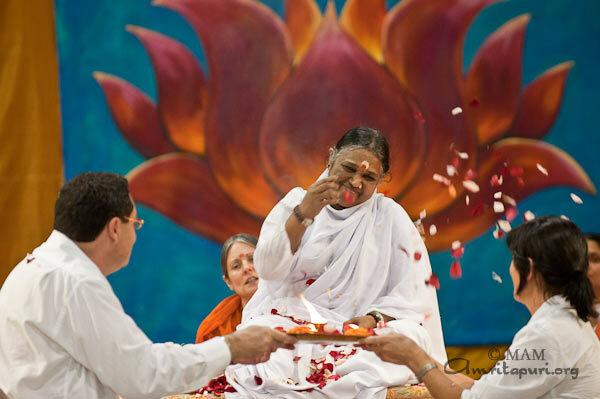 Amma gave satsang, bhajans, and led a meditation in both the morning and evening. 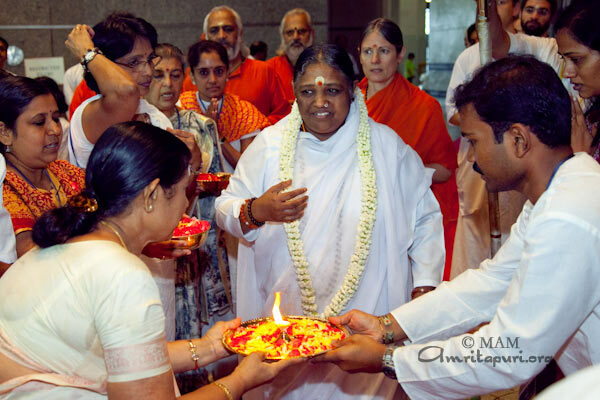 At the end of the darshan, Amma sang three bhajans. 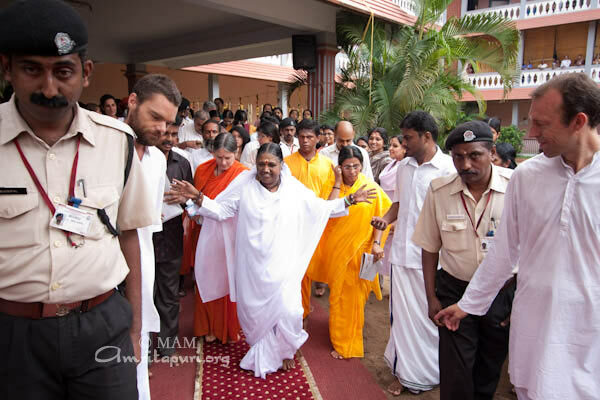 As Amma was leaving, a strong downpour started, bringing a coolness to the scorched earth. 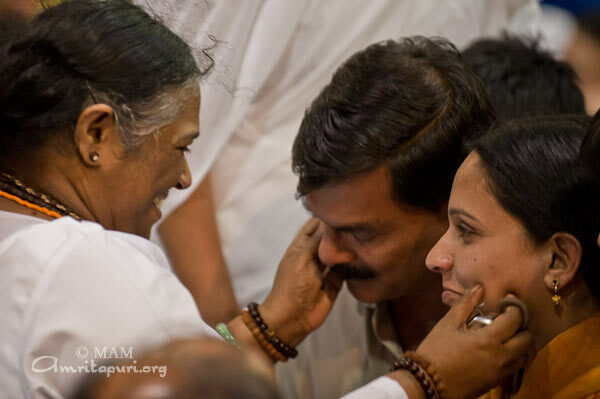 It was just like how Amma showered her love and compassion in the hearts of the devotees. 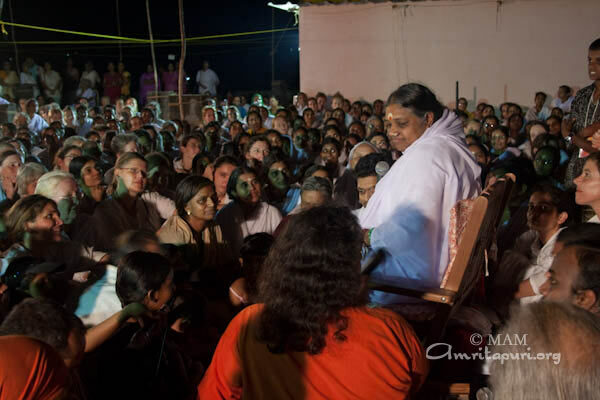 The day before the program in Trissur, Amma came to the roof of the Amrita Vidyalayam at around sunset. 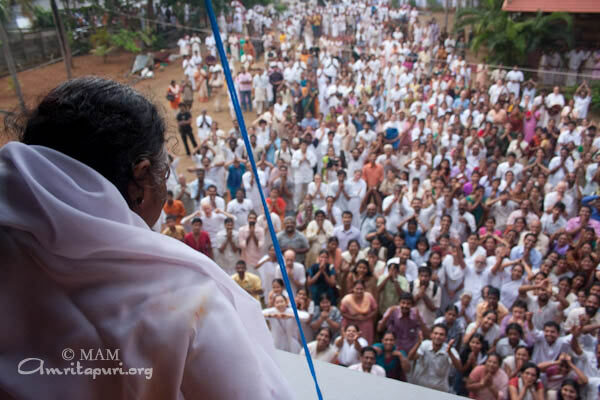 It wasn’t long before all the devotees and residents swarmed around Amma, like bees around a flower. 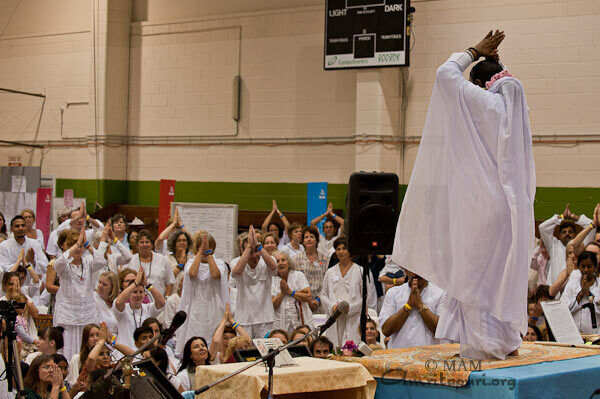 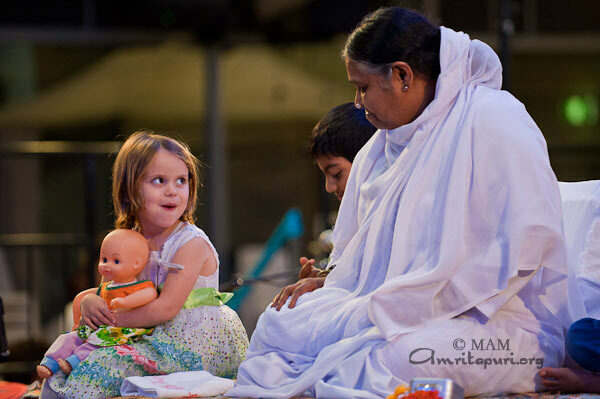 After meditation, Amma asked the devotees to share a joke or experience related to spirituality. 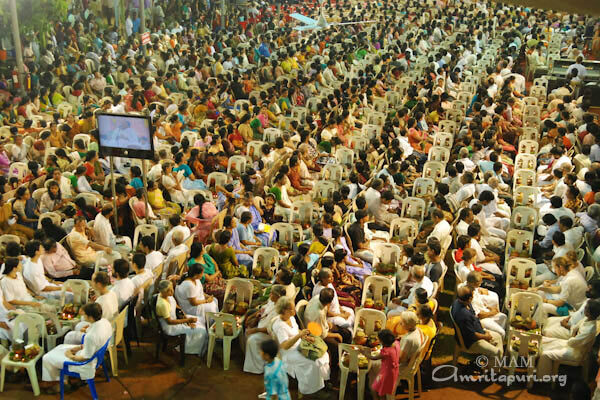 Amma – ‘Isn’t Amma the mother of all these children? 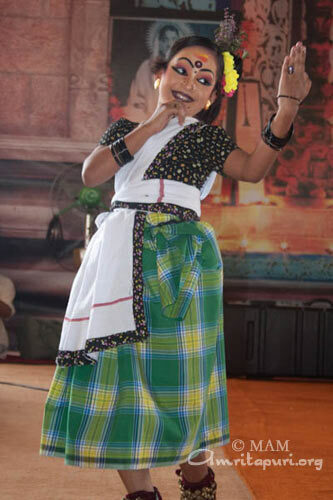 If you just look at this body, will you not get sorrowful? 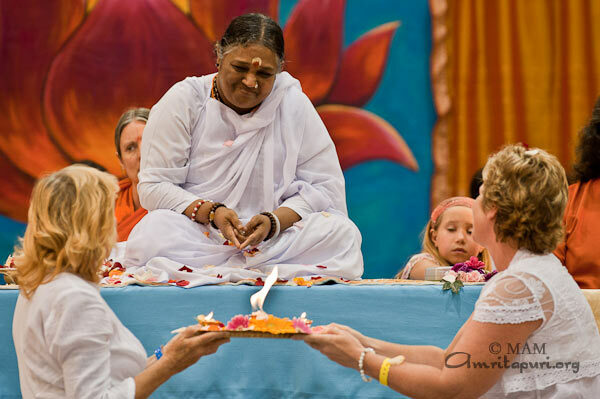 If you become so attached to Amma’s physical form, will that not bring sorrow to you? 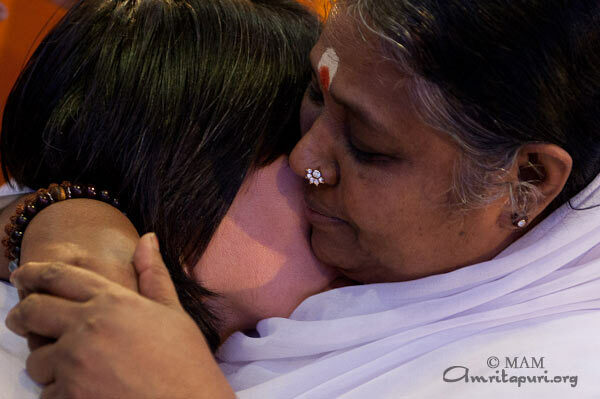 Amma: ‘You won’t always have Amma’s presence, and so you’ll always be sorrowful. 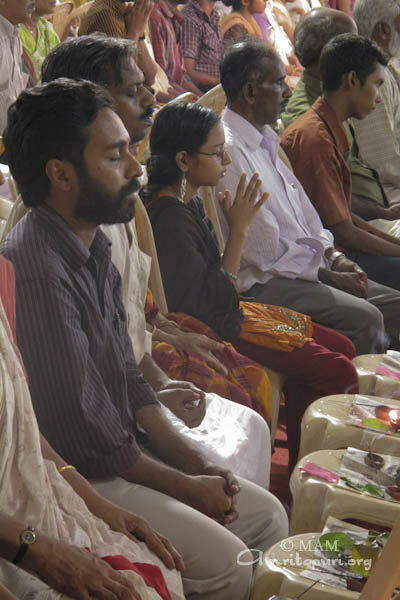 Brahmacharin: ‘Please bless us so that we don’t have any such thoughts. 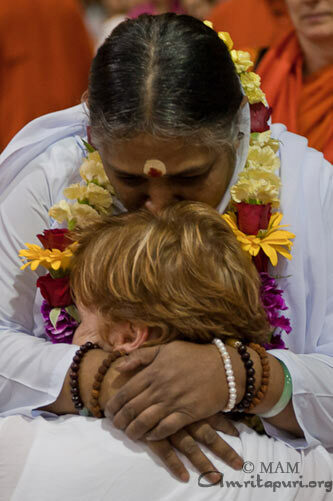 I want to love all of your children. 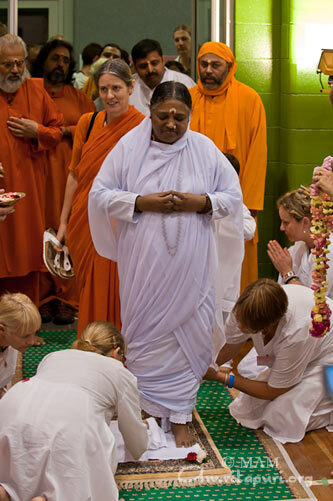 In fact, I can even give darshan. 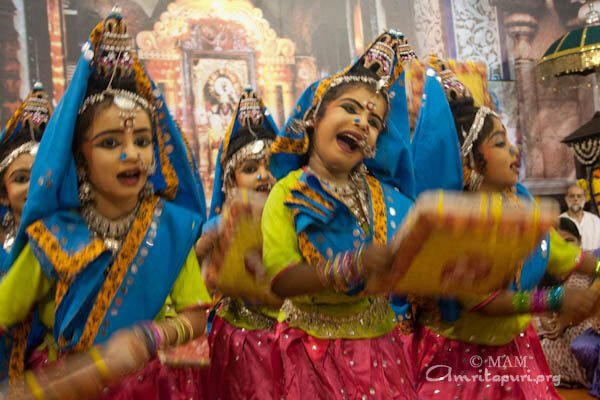 (everyone rolling with laughter) I don’t know whether Hanuman or the gopis had such thoughts. 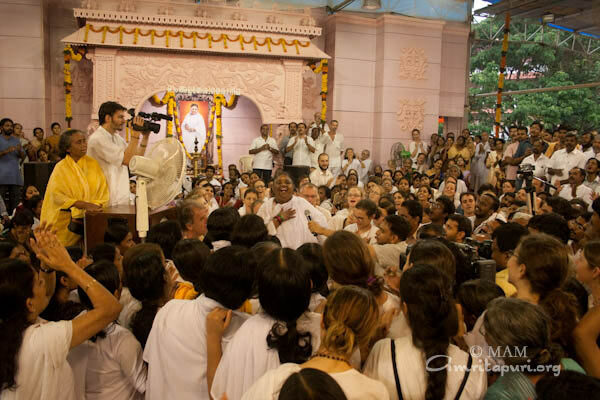 ‘What is that?’ asked the devotees. 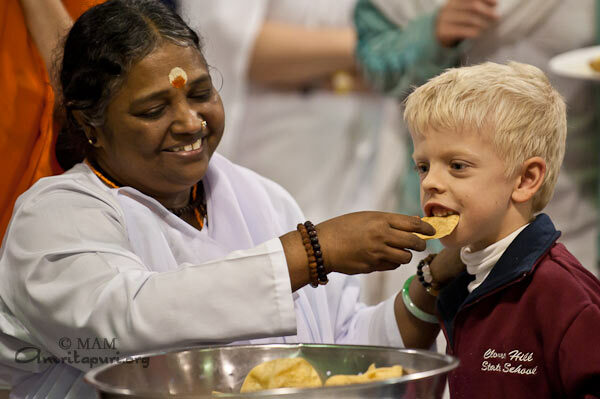 ‘I would like to snap my fingers near Rama’s mouth when he yawns (to prevent him from locking his jaw).’ The other devotees felt this to be a very insignificant job, so they agreed. 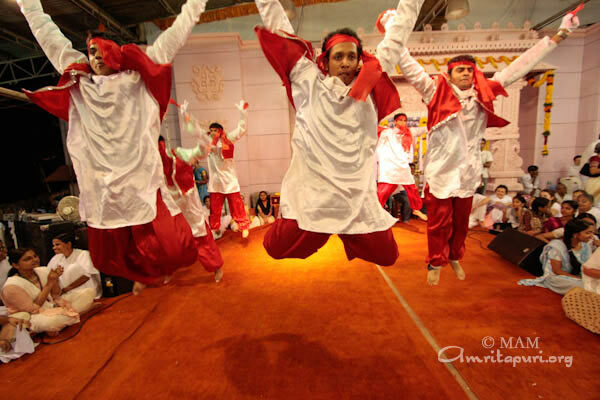 There is another story of Hanuman, that shows his resolute faith in his Lord, Rama. 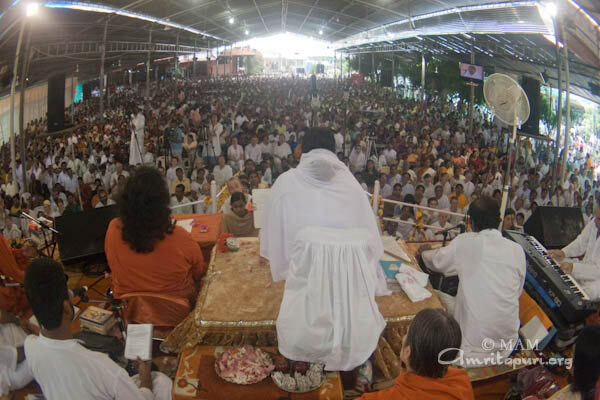 Once, Rama had resolved to punish a certain king. 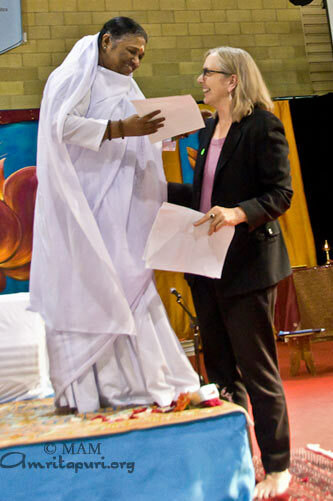 This king went to Hanuman for protection. 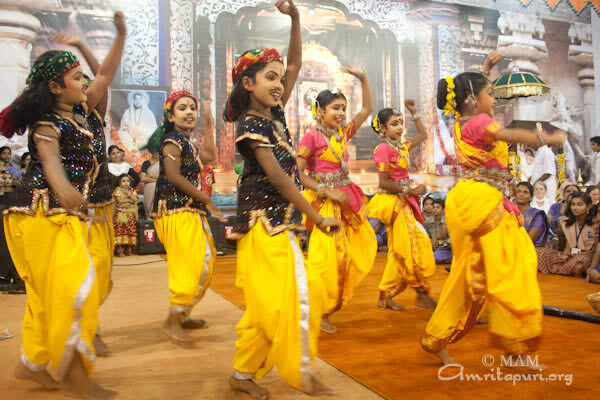 Hanuman wasn’t aware of Rama’s intention, so he promised to protect the king against anyone. 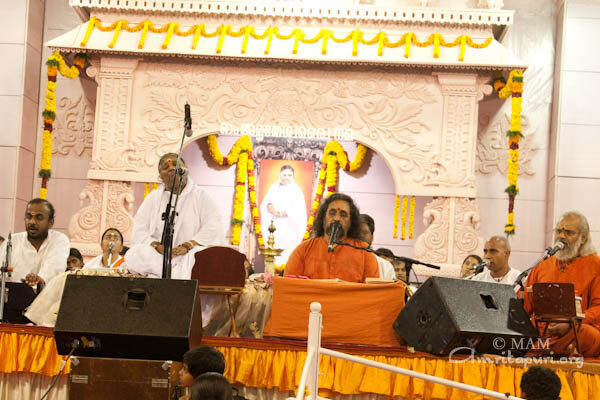 Finally, Rama came to the king in order to punish him. 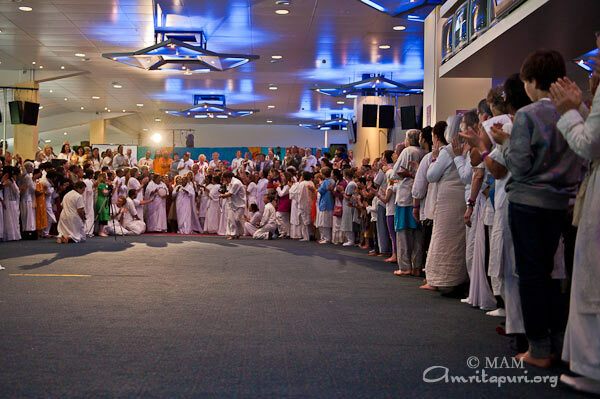 As Hanuman was bound by his promise, he stood in front of the king, offering protection. 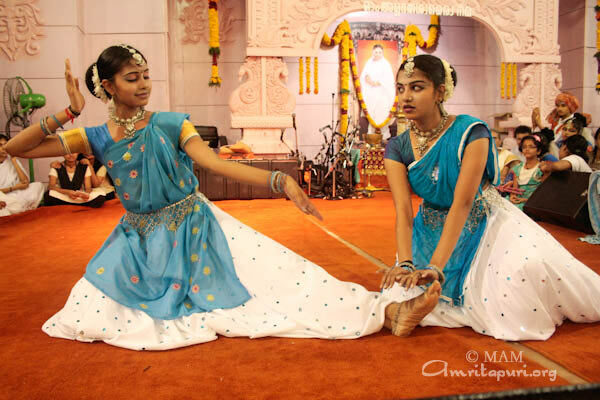 When Hanuman refused to get out of the way, Rama became angered and took out his bow. 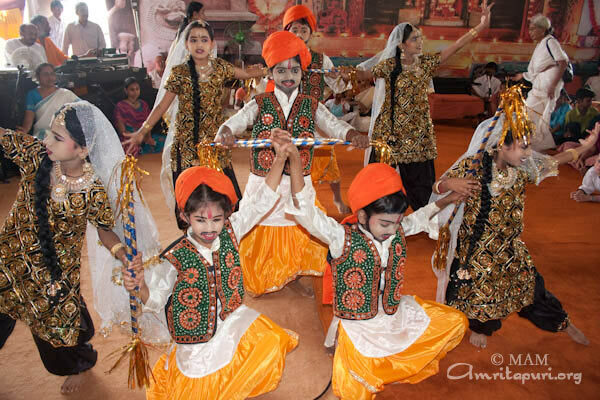 He shot arrows at Hanuman. 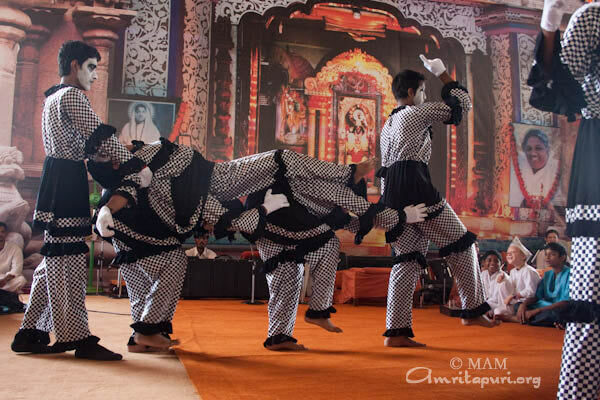 However, Hanuman didn’t fight back. 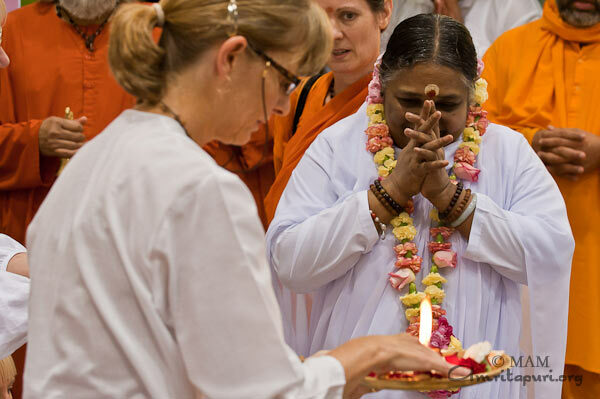 He closed his eyes, folded his palms together, and chanted Rama’s name with devotion. 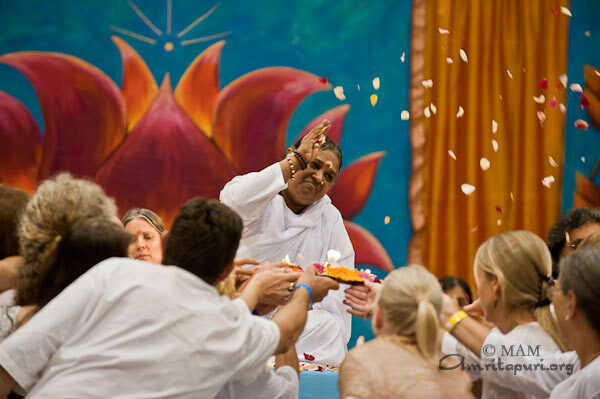 The arrows transformed into flowers and found their way to Rama’s feet. 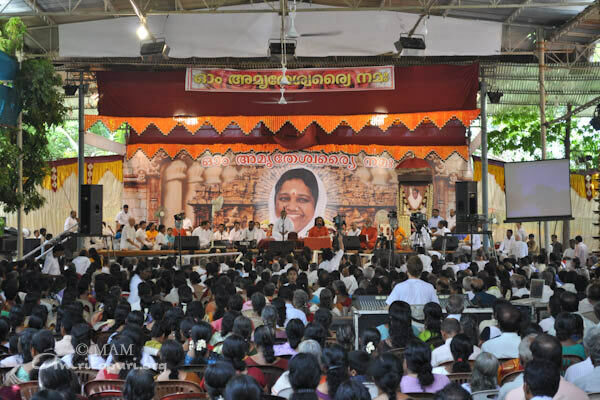 After Trissur, Amma gave two days of programs at the Brahmasthanam temple in Kochi. 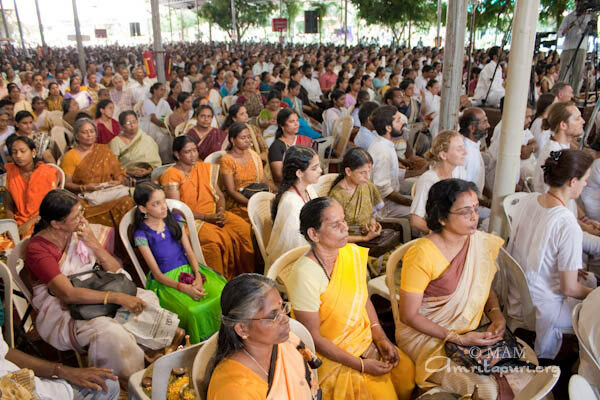 Kochi is home to many of Amma’s institutions, including the AIMS super-specialty hospital and School of Medicine, School of Nursing, School of Pharmacy, School of Business, School of Arts and Commerce, School of Visual Media & Mass Communication and the Amrita Vidyalayam. 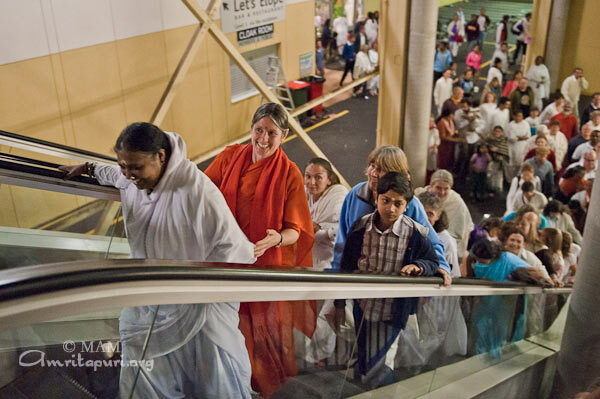 Many of the students and staff were eagerly awaiting Amma’s arrival the evening before. 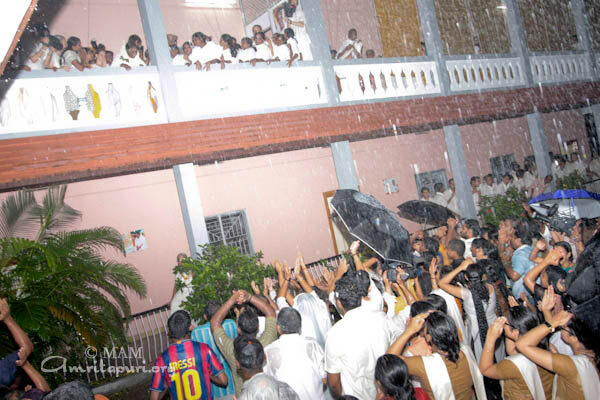 Actually, the month had been extremely hot, and as soon as Amma reached the premises, a small drizzle turned into a downpour. 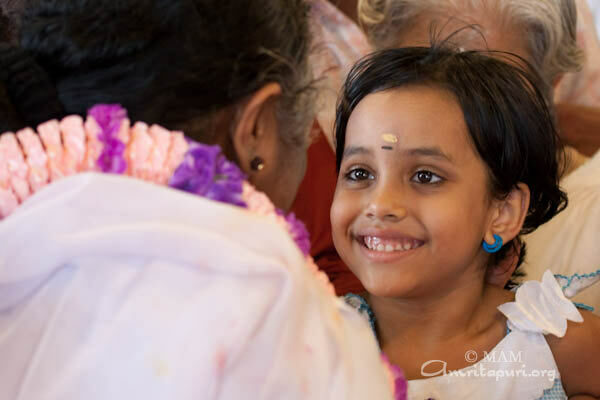 It was like a shower of grace for the devotees as they bunched together to get a glimpse of Amma as she walked to her room. 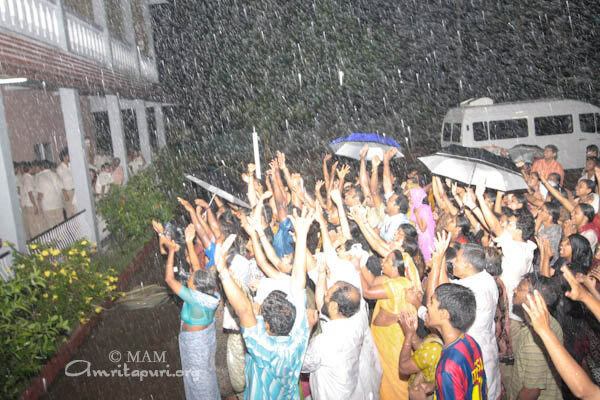 As she looked down from the balcony on the devotees, they were singing and dancing in bliss, despite the downpour. 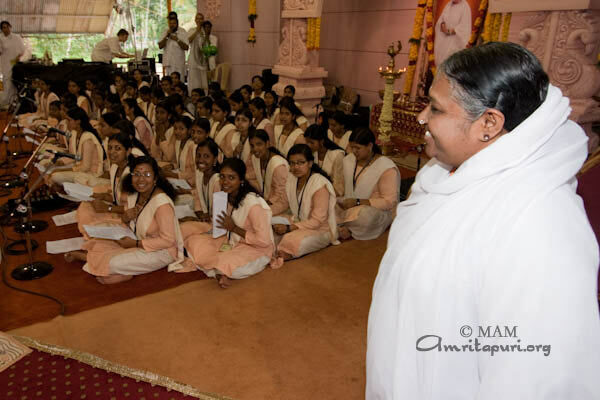 Before each program, the female students of Amrita University chanted Vedic mantras as Amma approached the stage. 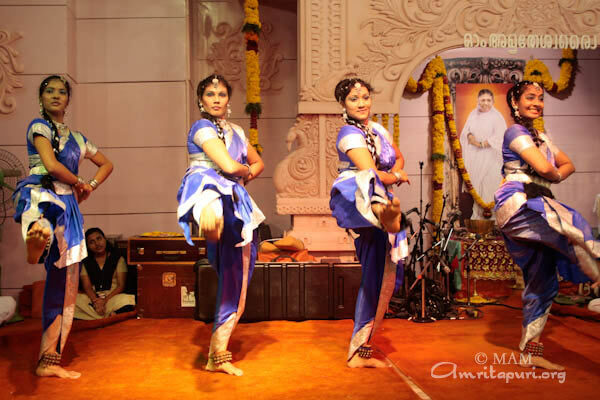 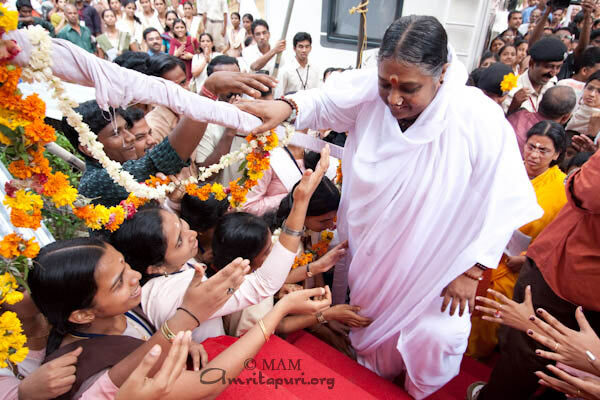 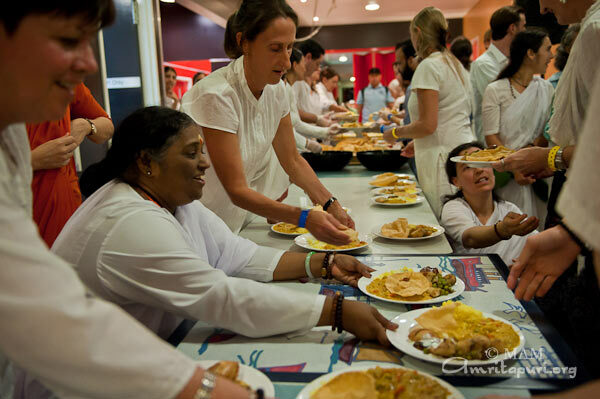 All the students participated in various ways to help the devotees who came to see Amma. 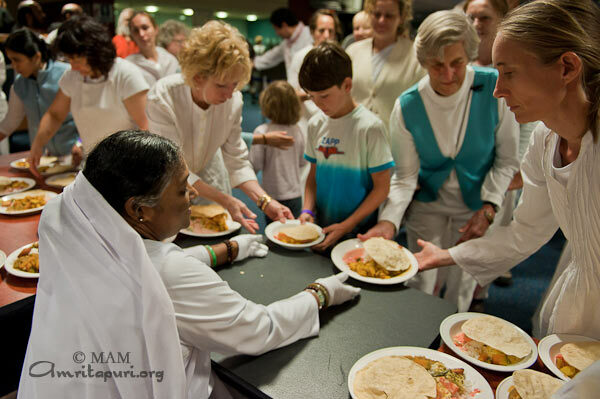 Some brought water during the programs, others served food, and others helped to collect and clean the plates during meals. 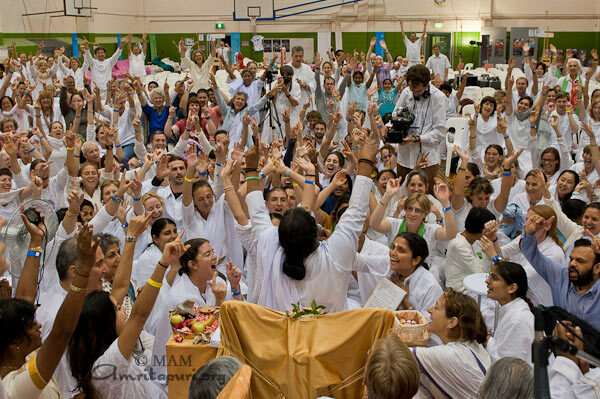 The local devotees also helped out with a lot of enthusiasm. 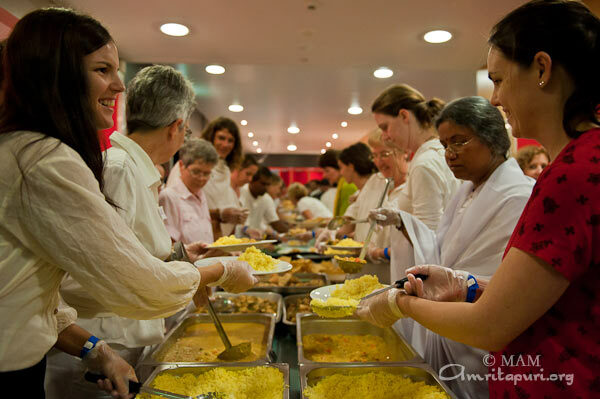 They formed lines for washing plates, singing bhajans and clapping as they worked. 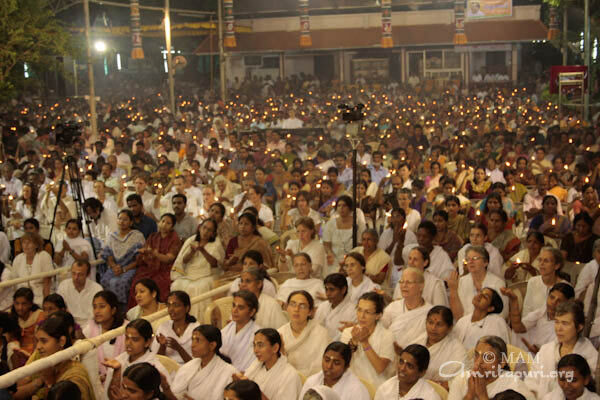 The devotion was very strongly felt in all the local devotees. 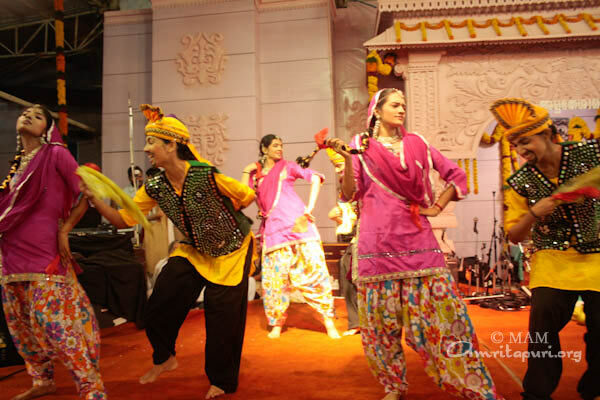 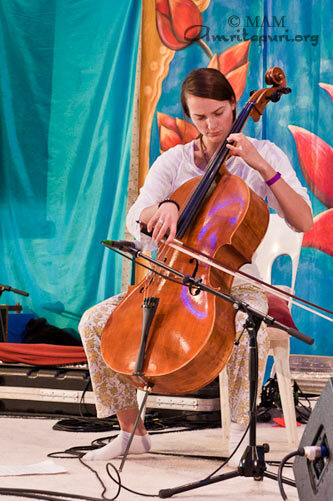 As part of the evening program, numerous charity events took place. 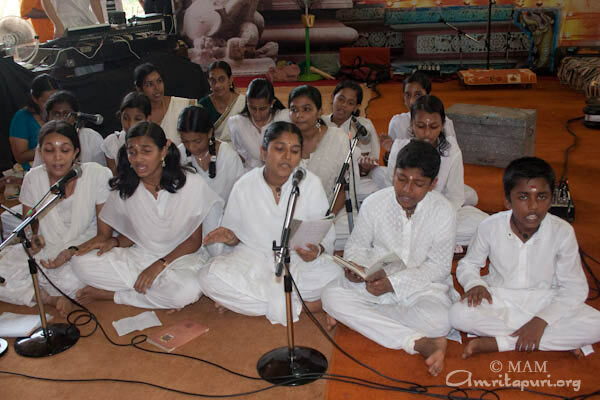 Youths representing a nearby village, Ezhikkara, gave a pledge in the presence of Amma. 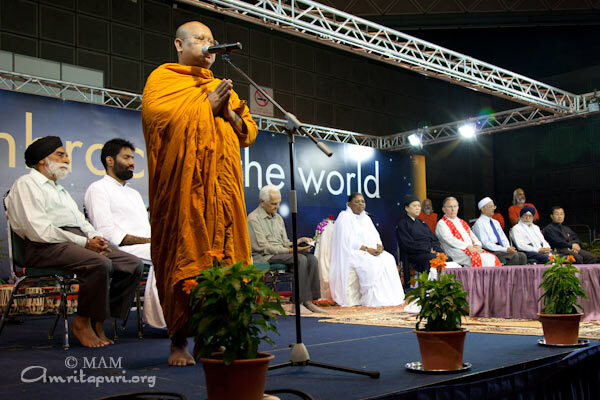 They said that they understand the negative effects of alcohol and drug abuse and promised to not be deluded into the use of such intoxicants. 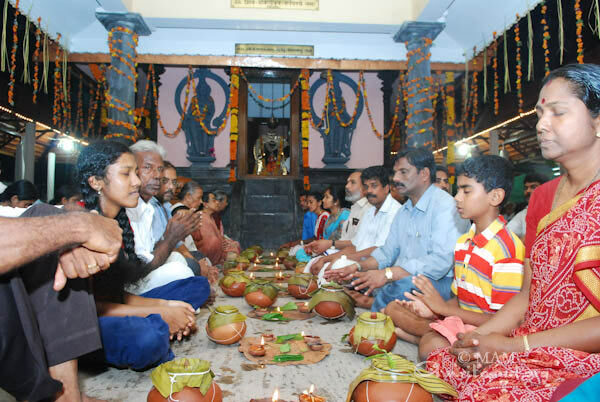 They took an oath to make their village intoxicant-free within the next 5 years. 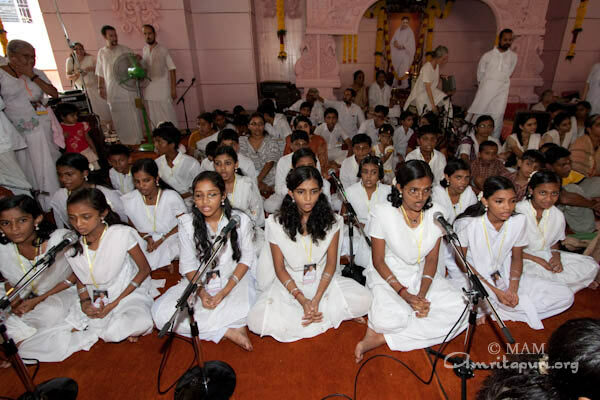 Scholarships to 200 students were distributed as part of the ashram’s ‘Vidyamritam’ free scholarship program. 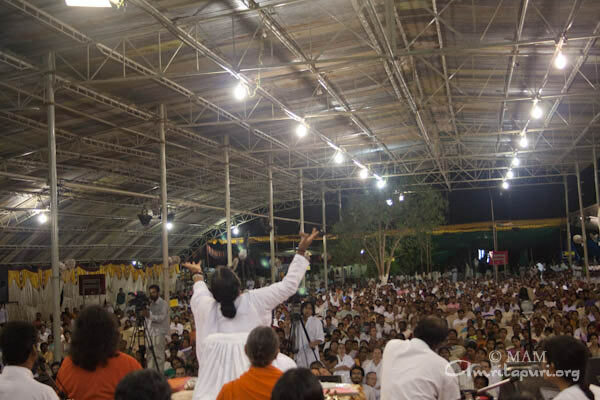 Pensions were also distributed to about 30 impoverished people from the area, as part of the ashram’s ‘Amrita Nidhi’ pension program. 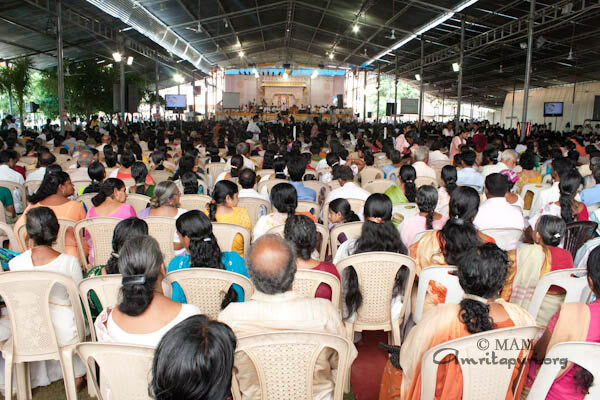 A High Court Justice and the Mayor of the city of Kochi helped to distribute the pensions and scholarships. 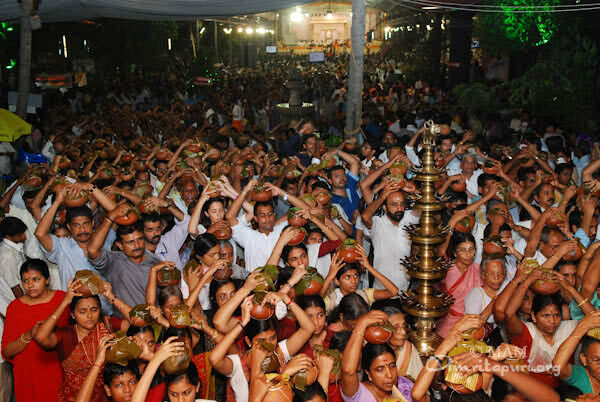 Many devotees participated in the evening Shani Puja, led by Amma. 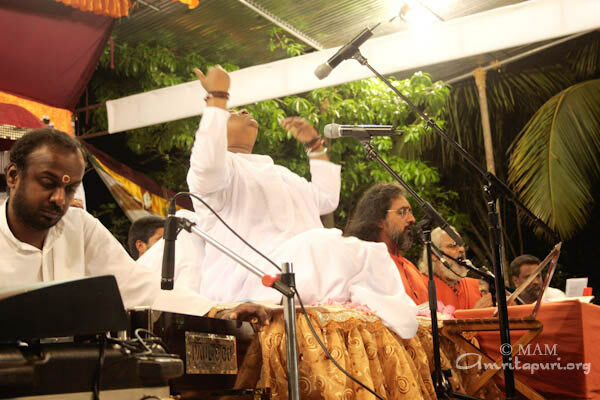 At the end of Darshan at about 6.45 am, Amma sang a Bengali bhajan – Kota tumi Jonani and rocked the stage. 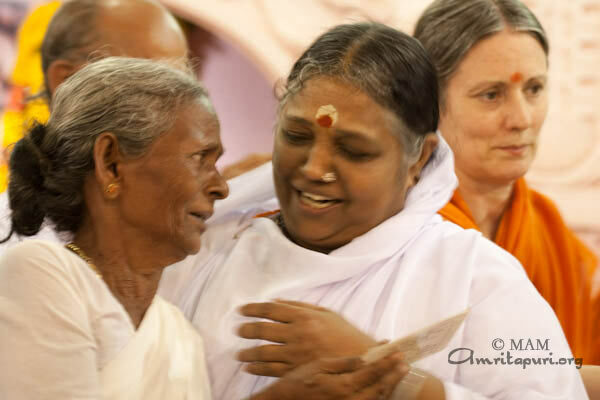 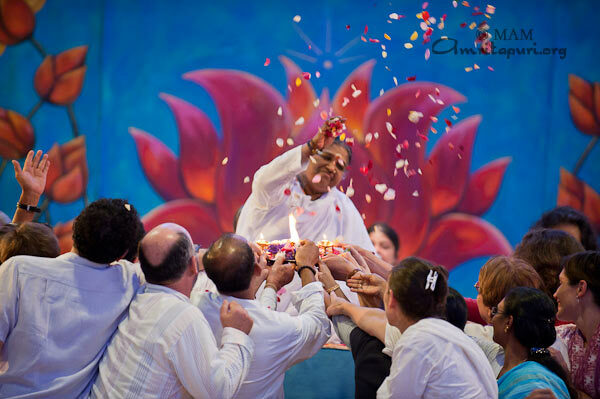 It was such a wonderful joyous moment and Amma was calling out ‘Maha Kali Ki Jai’. 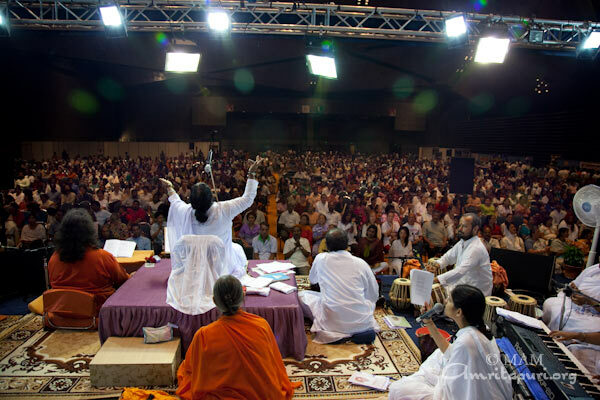 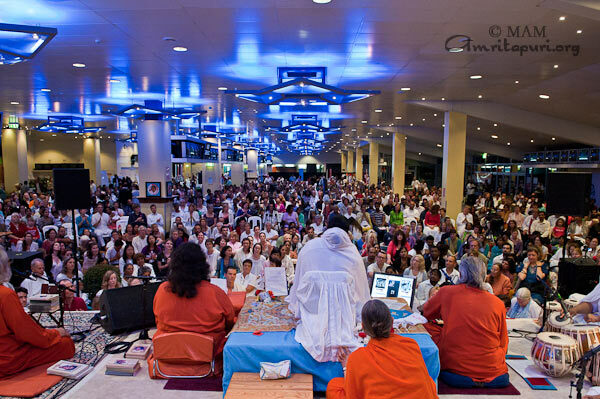 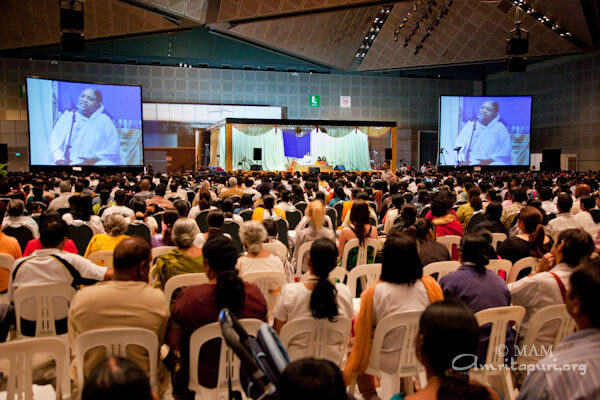 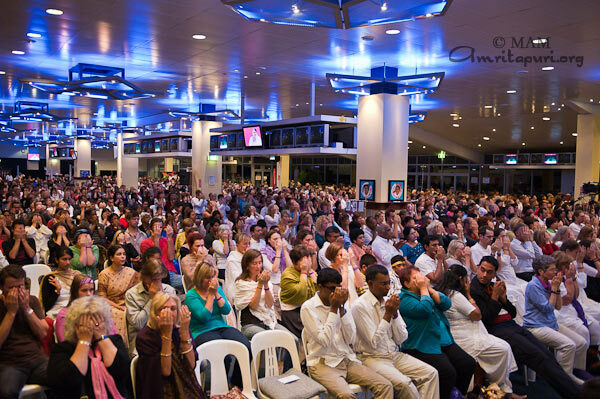 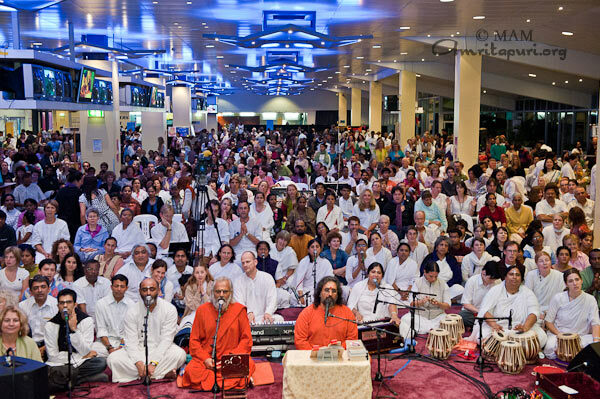 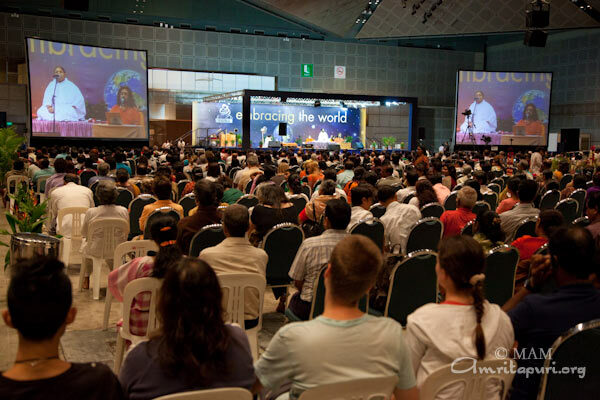 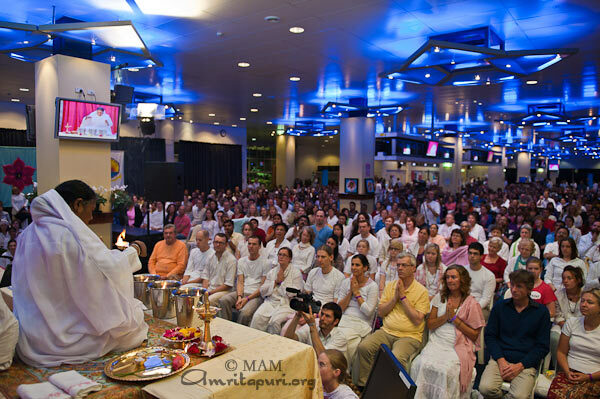 Amma graced the people of Singapore with Her presence April 15-17, 2010. 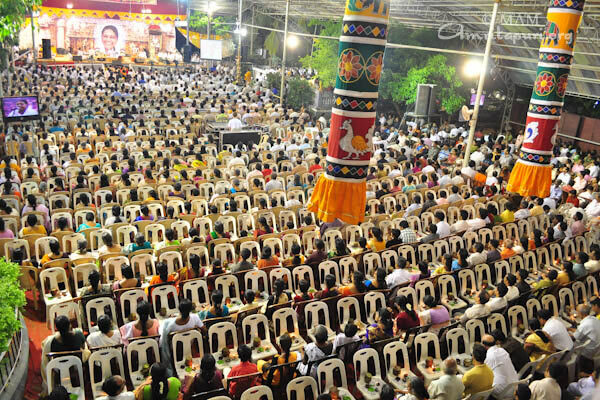 At the first evening program, Mr. Terrence Lee, Secretary-General, Loyang Tua Pek Kong, welcomed Amma to Singapore at the Chinese Taosist Temple (Amma laid the first brick for this relocated Temple in 2006). 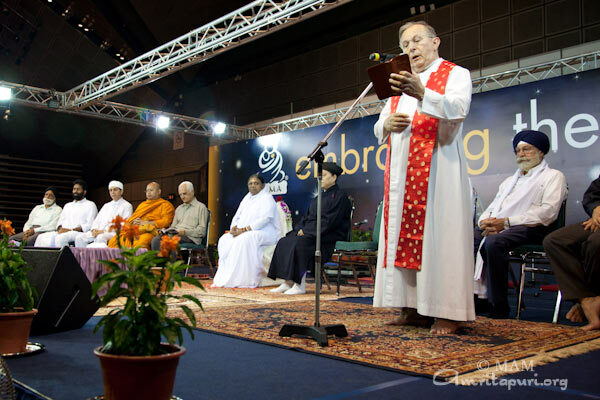 The launch of the partnership with the Singapore Red Cross was also launched by the President of the Singapore Red Cross, Mr. Tee Tua Ba, at the program. 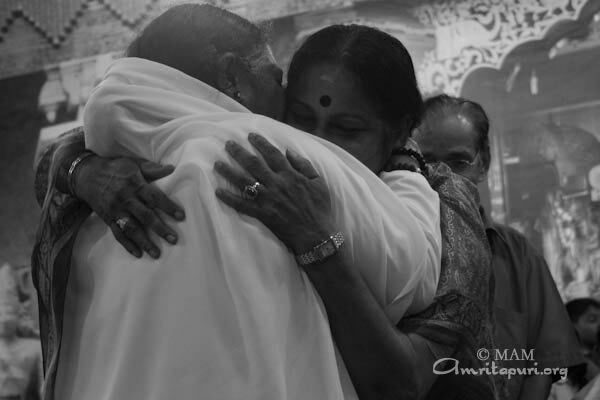 And Mr. Tee Tua Ba launched the commemorative book of Amma’s late father, Mr. Sugunanandan Edamannel, titled “My Daughter, My Mother”. 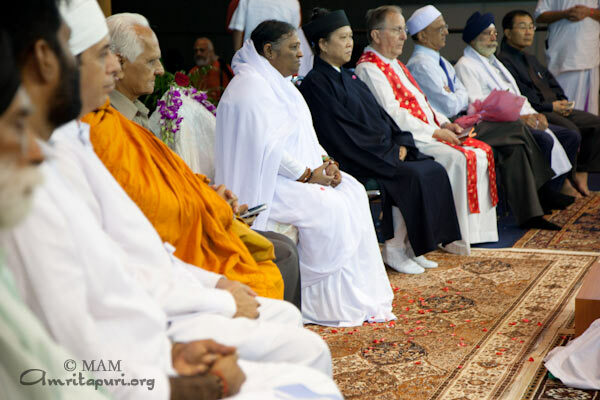 On the second day morning program, Honorary Secretary of The Inter-Religious Organization of Singapore and the Representative of the Muslim faith, Mr. Ameerali, garlanded Amma. 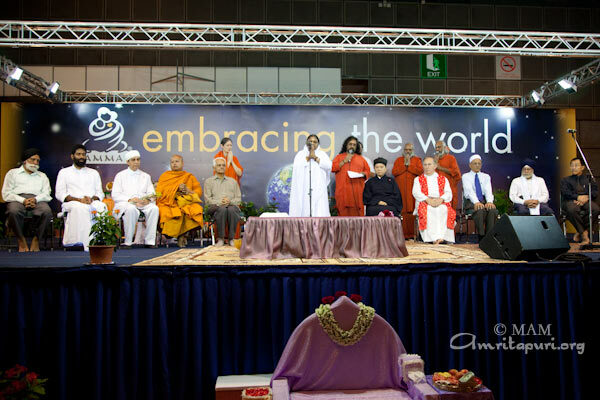 The different religion representatives presented a short prayer for World Peace in the presence of Amma. 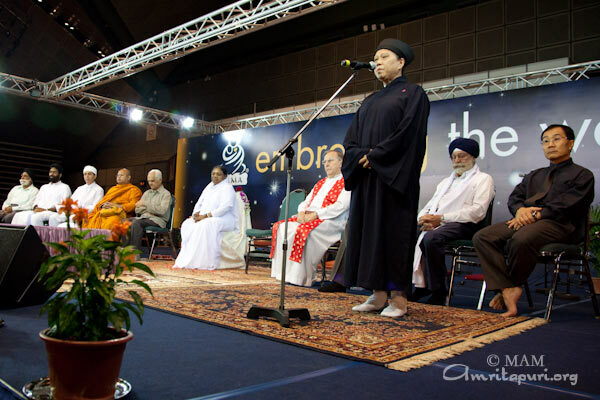 The faiths included Muslim, Christian, Taoist, Buddhist, Zoroastrian, Jain, Bahai, Hindu and Sikh. 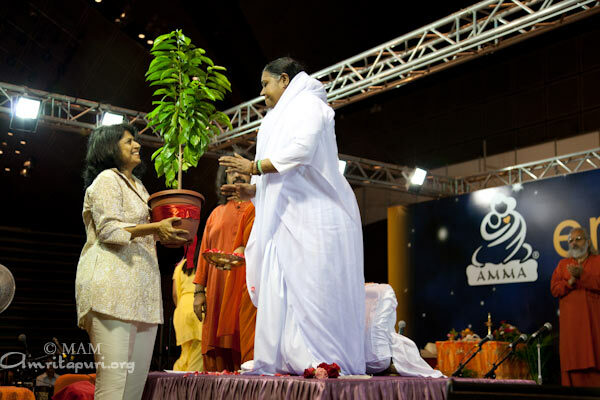 On the second day evening, Mrs. Kirtida Mekani, Executive Committee Member of the Garden City Fund under the auspices of Singapore National Parks Board (Governmental), came to accept the tree sapling (which will be planted on Earth Day, 22nd April) on the occasion of the donation of 50 tree saplings by the Amriteshwaryai Society. 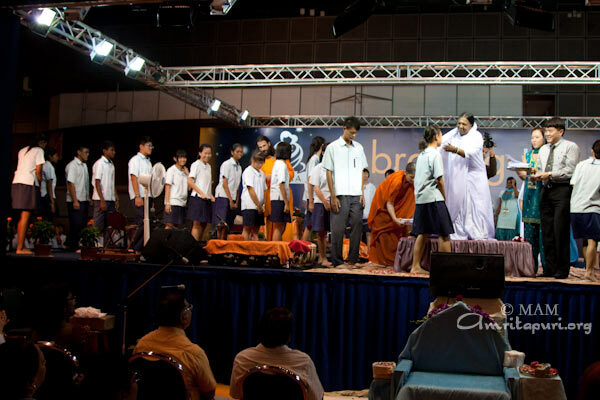 Deserving students of three secondary schools also received bursaries worth $150 Singapore Dollars each to help pay part of the fees of their National Exams. 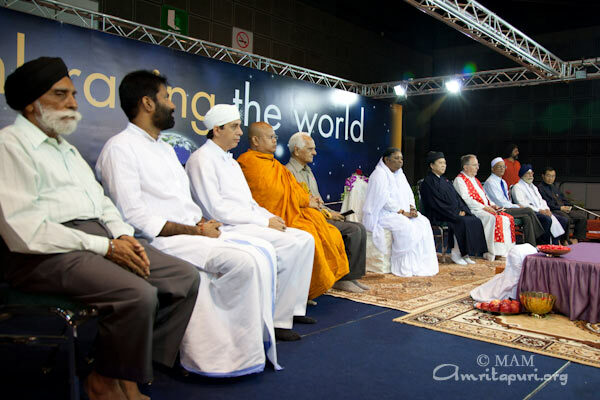 Japan program will follow after this. 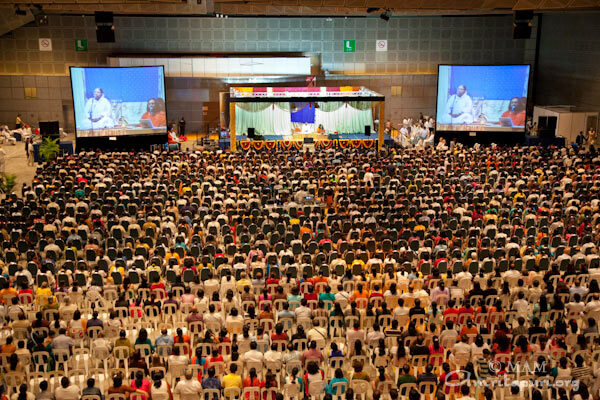 Yet to announce the dates. 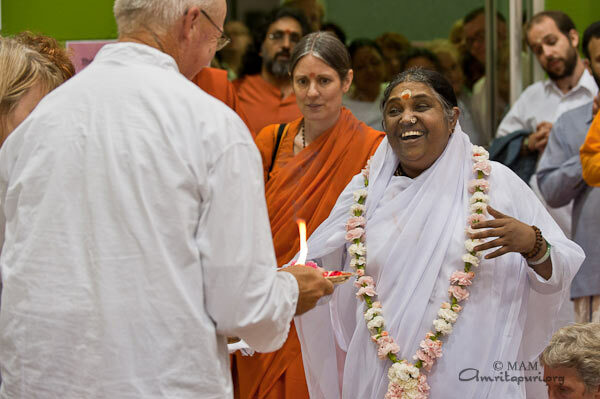 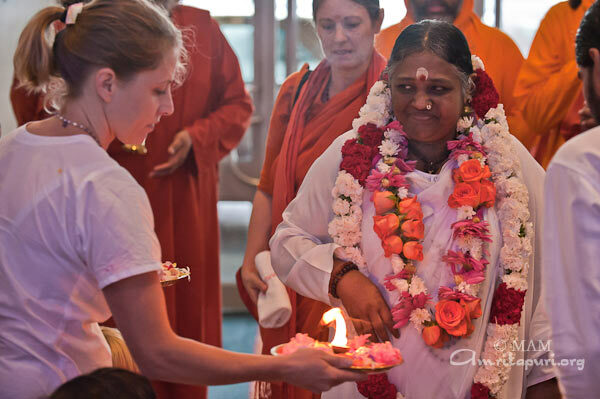 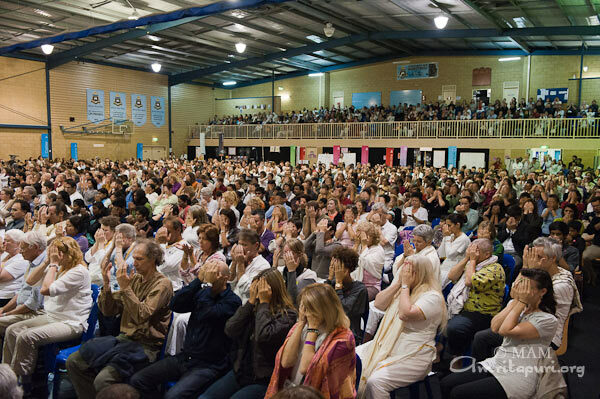 Over the last 2 weeks Amma has been travelling extensively throughout Australia conducting programs and puja’s for world peace and harmony in the cities of Brisbane, Gold Coast, Melbourne and Sydney. 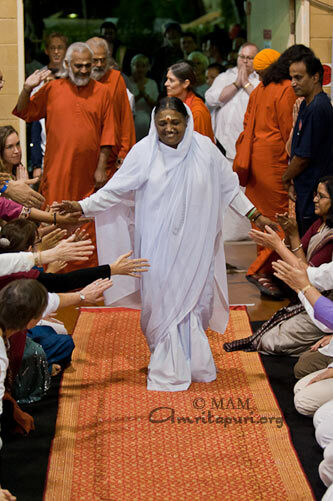 Amma held two days program at Sydney Boys High School, New South Wales, with Satsang, Bhajan, Darshan and a Devi Bhavadarshan. 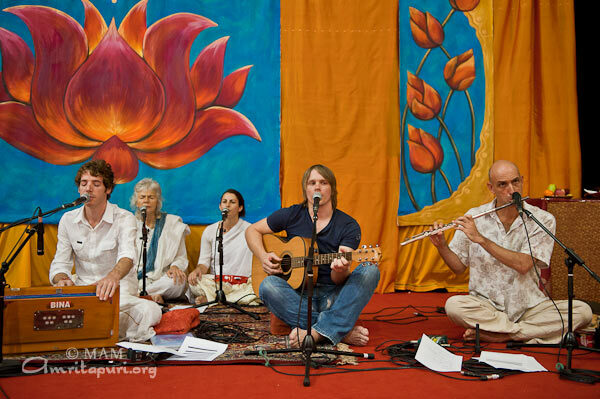 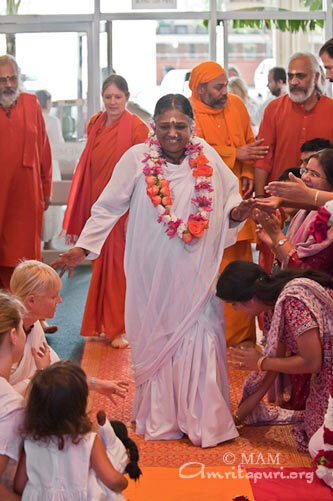 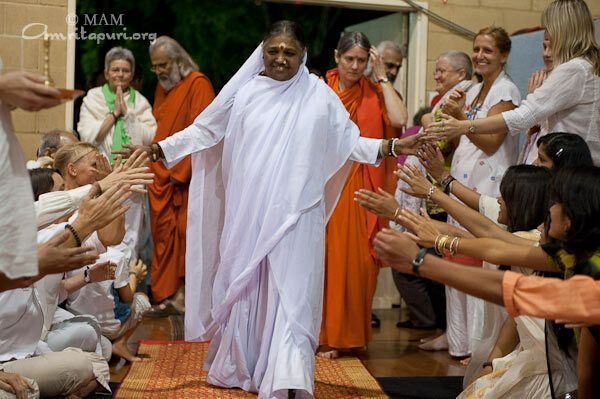 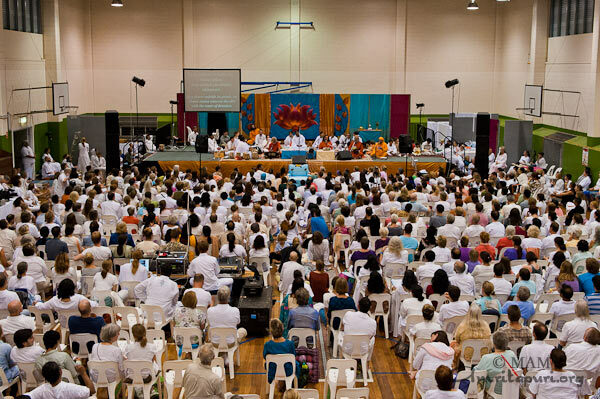 Amma held 3 days program in Tallebudgera Outdoor Recreation Centre, Gold Coast which included a retreat and Devi Bhava.